The renovations follow a series of conversations on campus led by Thomas Killian, Rice Management Company liaison, that sought student and faculty opinion regarding the use of the Innovation Hub. Killian coordinated with the Student Association’s Innovation Space Idea Collection Working Group, chaired by SA secretary Jefferson Ren. Killian said that these opinions were included with student feedback from the 10 Houston academic institutions involved in the project, including the University of Houston and Houston Community College. Ren said that he is in conversation with the Kinder Institute about sustained research and investigation into the social impacts of the Innovation District. Ren said that the timeline of the research is six months and will tie into the Institute’s recent gentrification report, which surveys gentrification in Harris County from 1990 - 2016. He also said that opportunities for student research into the district is a possibility. “[We] are still working on that, but we should have opportunities open to students sometime before the end of the semester,” Ren said. According to Ren, the working group will be active until around mid-April. They will present their findings to SA Senate, faculty and the Rice Management Company. Hanszen College Senator Tessa Schreiber said that the role of the SA in Ion’s development is limited to advocating for students’ opinions. 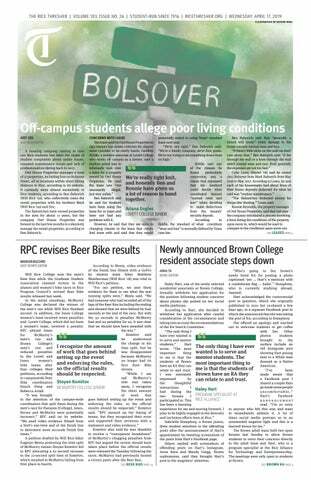 “However, we will continue to critically assess the development process, and how Rice is broadly using its resources in Houston, by asking questions and talking with administrators,” Schreiber, a Hanszen College sophomore, said. Student group Rice Left also held a student meeting soliciting feedback on the innovation district. Rice Left member and organizer Alice Liu said that conversations about the district began after the Thresher reported about student feedback on the district. Liu said that around 15 students showed up to the discussion. The press release states that the district will “combine a diversity of commercial development with housing [and] public spaces” with the goal of attracting entrepreneurs, tech industry players and venture capital investors. Killian said he has only been involved as an academic liaison and does not know what Rice Management Company plans on doing with the remaining 16-acre district. Rice Management Company Investment Manager Ceci Arreola did not comment by the time of publication. Ren said that feedback regarding plans for the district is currently outside of the scope of his working group. Liu said that Rice Left is currently discussing their plan of action regarding the district.